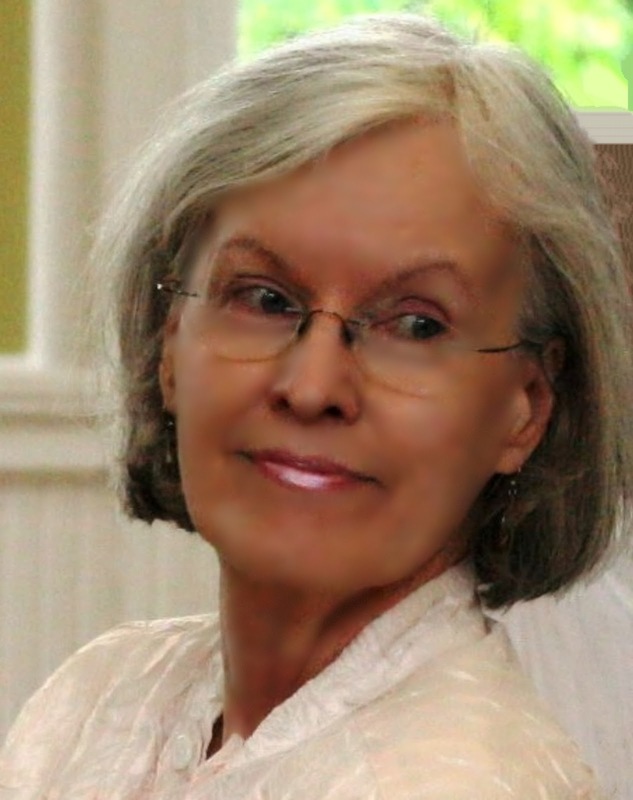 I am happy to feature Susan Laughter Meyers as my guest on The Poet on the Poem. I am confident that you will enjoy her poem and her comments about it. 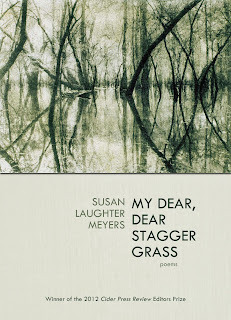 Susan Laughter Meyers is the author of My Dear, Dear Stagger Grass, released in August 2013 as the inaugural winner of the Cider Press Review Editors Prize. 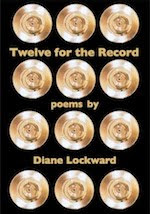 Her first book Keep and Give Away (University of South Carolina Press, 2006) received the South Carolina Poetry Book Prize, the Southern Independent Booksellers Alliance (SIBA) Book Award for Poetry, and the Brockman-Campbell Book Award. 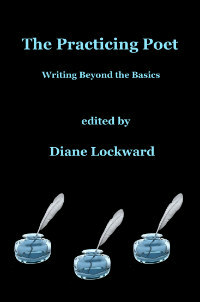 Her chapbook Lessons in Leaving (1998) won the Persephone Press Book Award. Her poetry has been published in numerous journals, including The Southern Review, Prairie Schooner, and Crazyhorse, as well as on the online sites Poetry Daily, Verse Daily, and Ted Kooser’s American Life in Poetry column. Today's poem comes from My Dear, Dear Stagger Grass. the shallows and bogs, Why, and again, Why, O why. DL: The diction in your poem is wonderful, e.g., pluff mud, spartina marshes, wet-footed spider lilies, salt myrtle, trumpet honeysuckle. How did you acquire all these succulent words? Did they appear in your first draft or did you add them to the poem during revision? SLM: From the poem’s inception I knew during the whole process of writing it that I would be knee-deep in language and sound. Just now I went back to look at the first draft—there were twenty-six drafts—and from the start the poem included image after image from the natural world; but of the ones you pointed out, only the trumpet honeysuckle was in the first draft. By draft three, though, the pluff mud and spartina marshes were there, as well as the spider lilies—though they weren’t wet-footed yet. So it was an early, but gradual, process—the accretion of language and imagery—and it’s a boon to us poets that the names for native flora and fauna are rich in sound. DL: I very much admire the way you've succeeded in animating the setting. Tell us how you created the sense of motion and energy that pervades the poem. SLM: I wrote the poem not long after the active hurricane season of 2005, the year of Hurricanes Katrina and Rita among others. So the sheer energy of the storms was still with me. Despite the danger from hurricanes, the love for the lowlands and the wild beauty there persisted in my mind. More than once I’ve been in the situation of whether or not to evacuate—and if so, when—and it’s hard to leave, despite the danger. In the poem I wanted to show the attachment to the land, to a way of life, to the wild and even the less-than-beautiful aspects of the coastal plains. Most of the images that came to mind as I was writing have their own motion of some kind—the snakes and alligators, the owls, the shrimp boats at work—that energy plus the force of the wind in the poem, always the wind—well, all of these, together with the fear, attachment, and uncertainty stirred up by the storm at hand, contributed to my own sense of agitation and unrest. And I hope that the swirling energy was conveyed. DL: One of the feats of this poem is its syntax. How difficult was it to get one long sentence to sustain the entire poem? Tell us, also, about the function of the dashes. SLM: I love what syntax can do in a poem, its ability to indicate not just sequence but also hierarchy and relationships, its role in manipulating the rhythm and pacing. Syntax is truly like a conductor leading an orchestra. Because “Coastland” consists of a sustained list, it felt natural for it to be one long, convoluted sentence. I wanted the movement of the poem to be somewhat like a spring that uncoils, a movement that seemed fitting for a poem of wind. As you can tell, too, I’m fond of dashes. I often use them to interrupt myself or to set off an explanatory phrase, sometimes for the extra-long pause that I’m aiming for. Other times I use them because I’ve already used commas, and further commas to set off the phrase or clause would simply be confusing. DL: Your use of anaphora is hypnotic and all the more impressive because it occurs within one long sentence. The repetition of "upland from" and "from the" scattered throughout the poem adds speed and intensity. How did you decide how much was enough and not too much? SLM: I did play around with that as I revised, but actually the frequency of those repetitions settled in sooner than I expected, probably because I kept reading the poem aloud. That’s the only way I can make those sorts of decisions, to hear the rhythms and patterns sounded out in different ways. While I’m reading my poems aloud, I hold my hand up close in front of my mouth as I read so that the sound bounces back to my ears. Then, and only then, can I begin to tell what is and isn’t working. DL: Although there's no end rhyme, you make the poem sing with other sound devices—alliteration, assonance, consonance, and monosyllabic words. Tell us about the craft decisions that resulted in the poem's music. SLM: I try to follow sound whenever I can. Thus, when I make diction choices, they’re often based on sound. The more I do this, the more it becomes natural to me. As a result, my ear is becoming more attuned to sound patterns. Reading the poem aloud comes into play, too. One example from the poem is those spider lilies mentioned earlier. In an early draft the image focused on “the spider lilies’ white thin stars,” referring to the narrow-leaved white flowers of native spider lilies that grow in swamps and along the edges of rivers. I liked the description of the flowers, but the image didn’t seem to do anything for the sound and rhythm of the poem. Eventually the wording became “the wet-footed / spider lilies,” which meant a loss of the flowers as stars but a gain of the rhythm and sound repetition in “wet-footed.” That’s the kind of change I’ll make for the sake of a poem’s music. My reading directly affects my craft decisions, too. I seek out poems by other poets that are musical, hoping to learn from them. There are so many decisions to make! Thank goodness, many of them are ones we’re not even conscious of when we make them. Some of those good, unnoticed decisions derive from the bones of our writing practice—and old failed poems. Readers, please listen to Susan's reading of her poem. The book launch reading for The Crafty Poet: A Portable Workshop was held on Sunday, November 10, at the West Caldwell Public Library. We had a perfect day for it and a heart-warming turnout. A total of seventeen poets came to read. Here are some photos, in the order of the reading. I used the structure of the book to structure the reading. This is an early picture of the audience arriving. We had 52 people for an afternoon of poetry. 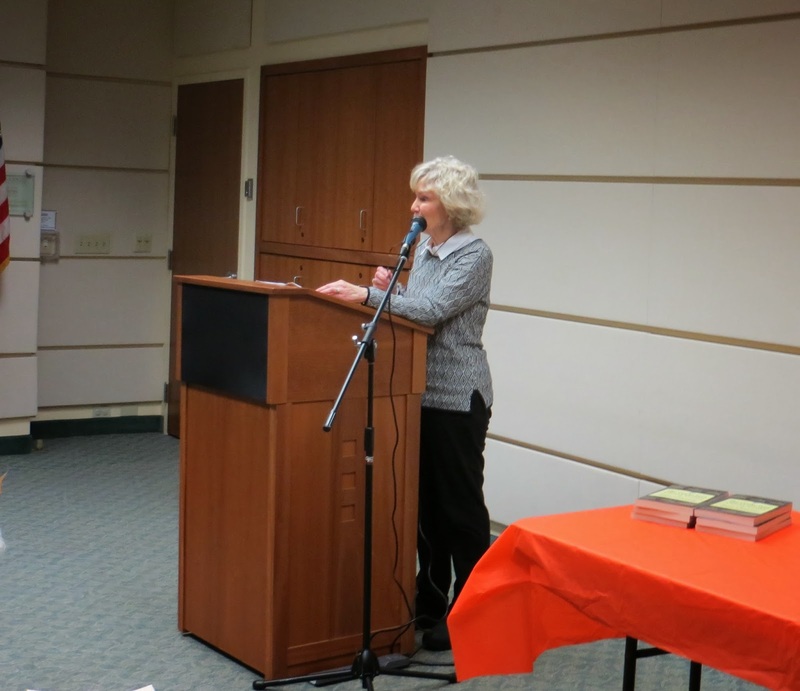 This is me, Diane, welcoming the audience and introducing the book. written to the prompt that accompanies Karin Gottshall's model poem, "More Lies." "Gassing Up in New Jersey, Just Before Midnight." also read "To the Inarticulate Man Who Tries." accompanies Amy Gerstler's model poem, "Advice from a Caterpillar." and the book as a gift to his doctor on his next visit. 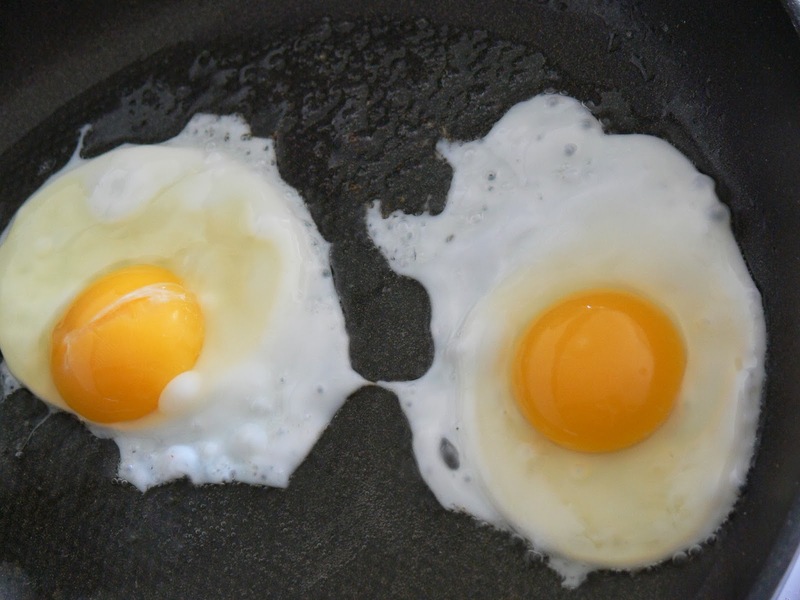 that accompanies Jeanne Marie Beaumont's acrostic, "After." Gail Gerwin reads "Rosebuds Ungathered," another acrostic poem. Jennifer Maier's model poem, "Post Hoc." Bronwen Butter Newcott reads "Love," the model poem that begins this section. Wanda Praisner reads "After Love," the sample poem she wrote to the prompt for Bronwen's poem. for Stanley Plumly's model poem, "In Answer to Amy's Question What's a Pickerel." for Richard Jones' model poem, "White Towels." 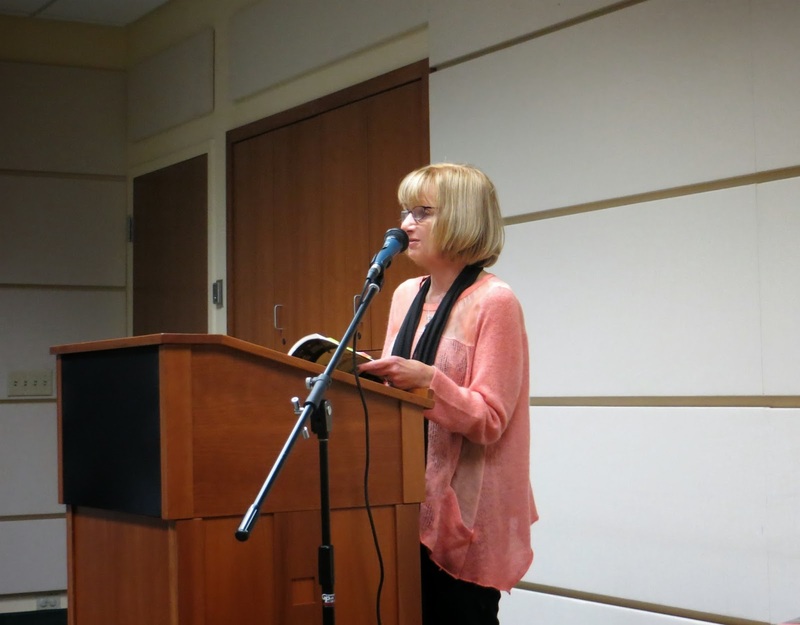 Delaware Poet Laureate JoAnn Balingit discusses her craft tip, "The Promise of Syntax,"
and then reads one of her poems illustrating a syntactical device. Marie-Elizabeth Mali reads "Second Year of Marriage," the model poem that begins this section. that accompanies Adele Kenny's poem, "Snake Lady." with lots of enthusiasm for revising poems and writing new ones. Following the reading we had a reception with homemade cookies made by me—brownies, white chocolate chip and chocolate chip cookies, toffee delites, date nut bars, and lemon love notes. While people munched and talked poetry, I signed books which felt like a perfect way to end the party. 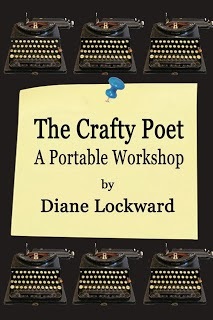 The Crafty Poet is available HERE. It happens to all of us, poets or otherwise, but more often to poets than to normal people. We get rejected. Someone slams the door in the face of our poems. Someone tells them they don't fit. There's no room at the inn. They're told to try again. They're wished good luck placing themselves elsewhere. Part of the work of a poet is to put the work out into the world and hope it finds a good home. But before it does, the work usually comes slinking back several times. Nobody likes rejection, but it really shouldn't be a devastating blow. My submission mantra: It takes twenty rejections to get an acceptance. I don't mean of the same poem as I assume that we're all sending out multiple poems and to several different journals. Keeping my mantra in mind, that means that each rejection puts you one step closer to an acceptance. 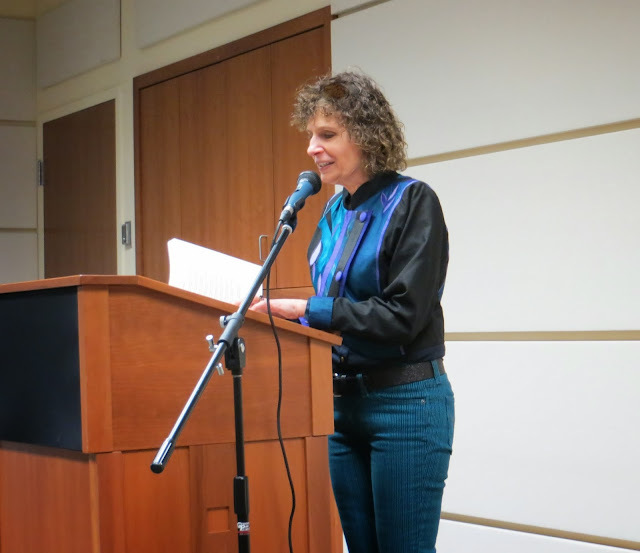 Two of the poems were accepted by Ithaca Lit. As a result of that publication, I was invited to be a guest editor for an upcoming issue. That turned out to be a wonderful experience. Two of the poems were published by Connotation Press. One of those poems, a sestina, was subsequently accepted for a forthcoming anthology, Obsession: Sestinas for the 21st Century, edited by Carolyn Beard Whitlow and Marilyn Krysl, to be published in 2014 by University Press of New England (UPNE). One of the poems was published by Innisfree Poetry Journal. The sixth poem appears in the current issue of Rose Red Review and just received a Pushcart Prize nomination. See what I mean? All six poems found homes elsewhere. Maybe the first editor didn't want or even like them, but some other editors did want and like them. Lesson? You know what the lesson is.